« Doggies are Bridal Styles Brides’ Best Friends! 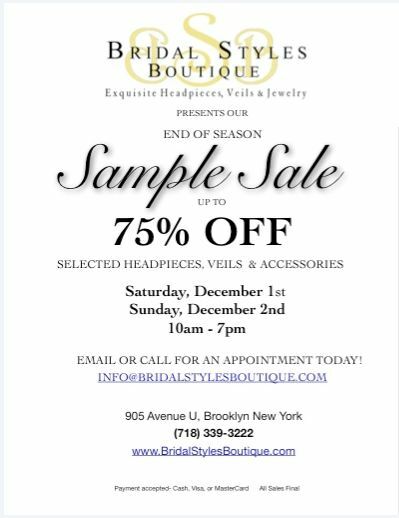 Bridal Styles Boutique 2012 End of the Year Sample Sale! Yes ladies, its finally that time of the year again… time for Bridal Styles Boutique’s Annual End of the Year Sample Sale event! The weekend of December 1st – 2nd, hundreds of select pieces from our stunning collection will be on sale, UP TO 75% OFF!!! Our doors open at 10am to 7pm each day and it is by appointment. We want to help you find just the right pieces, but things get a little hectic here at sample sale time so schedule you appointment NOW! Here is a glimpse of one of our previous sample sales. *A portion of the proceeds will go toward helping the young victims of Hurricane Sandy have a better and more joyous holiday season . This entry was posted on Sunday, November 18th, 2012 at 9:05 am	and is filed under Announcements. You can follow any responses to this entry through the RSS 2.0 feed. You can skip to the end and leave a response. Pinging is currently not allowed.